Quadriplegia is a consequence of cervical spinal cord injury resulting in the significant loss of physiological function; both sensory and motor. One key challenge of quadriplegia, which distinguishes this specific high level of spinal injury from other lower levels of injury, is that of thermoregulation. From a sensory perspective, there is reduced afferent information from the skin and deep body temperature receptors, thus reducing the level of thermal input to the hypothalamic thermoregulatory centre. 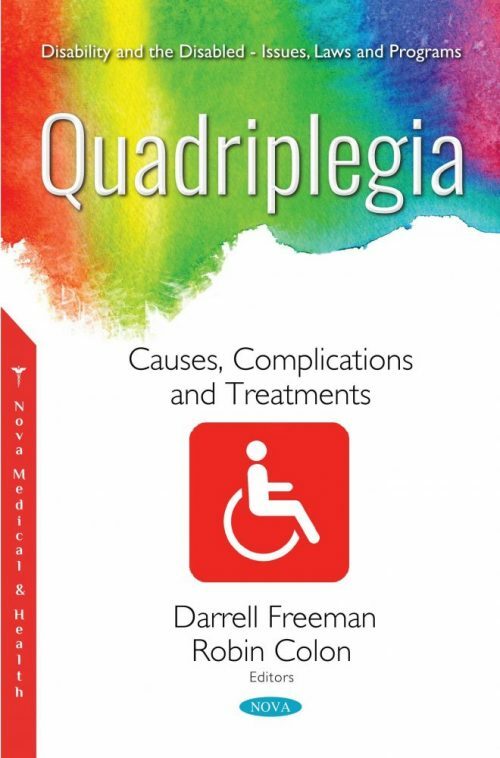 In Quadriplegia: Causes, Complications and Treatments, the authors evaluate the literature pertaining to thermoregulation in persons with quadriplegia at rest and under a range of thermal challenges such as heat, cold and exercise, comparing to paraplegia where appropriate. Classification of spinal cord injury assesses the remaining sensory and motor function. Thus, specific sympathetic nervous system related responses are not generally assessed. When considering the thermal dysfunction associated with quadriplegia and the resulting potential impact on health and activities of daily living, thermoregulation may also be of benefit in assessing function. The way thermoregulation has been considered regarding the classification of spinal cord injury and recent developments in the area will be highlighted alongside discussion of key issues such as core temperature measurement in this population. The authors also report on the status of our knowledge about the rates of cognitive impairment following persisting spinal cord injury and its impact on adjustment, as well as report on findings from recent studies examining: (i) differences in cognitive performance between adults with a chronic spinal cord injury and able-bodied adults, and (ii) differences in psychological and medical status assessed up to 12 months post-injury, in adults with a spinal cord injury who have cognitive impairment versus no cognitive impairment. Results showed that: (i) almost 30% of the adults with spinal cord injury had significantly lowered cognitive performance, with the risk of having cognitive impairment being almost 13 times greater than for someone without a spinal cord injury, and (ii) the risk of experiencing increased levels of psychological and social problems and medical complications was significantly elevated in adults with cognitive impairment after they transitioned into the community. In the closing chapter, considering that the association of post-spinal cord injury paralysis with autonomic, respiratory and hormonal alterations may increase the morbidity and mortality rate, the authors aim to characterize these dysfunctions in people with spinal cord injuries in order to facilitate the diagnosis and determine the appropriate treatment.